Hello Happy Site Owners! This week’s tips include six value selling techniques, trouble with OptimizePress, new playlist shortcodes, a new cool theme from StudioPress, and a new podcast from the Genesis Round Table, a super new Genesis Featured Page plugin, why website design costs differ from person to person, building your blog audience, how social signals impact SEO, how G+ profiles and pages gain SEO authority, and a super reference guide on SEO for 2014 for non-SEOs. So let’s dive in. Listen to the podcast. I bet some of you have noticed that I haven’t been blogging much for the last few months except for Tips Tuesday. For a while now I’ve been telling you about all of the ways I’ve been changing BlogAid and the new services that I had been doing quietly and finally went public with. Well, business has been pouring in. On top of that, one of the new services that I hadn’t released publicly until now is site performance. And all of that is what took me away from blogging for a spell. Have a look at the case study I released yesterday on a site that the owner and I have been tweaking for the last few months. It took lots of changes to go from 7 second page load times down to a .5 second. That’s a 1400% increase. And it took looking at the whole site, from the hosting to the bot hits, to optimizing everything, including the static areas of the site. And here’s the kicker. There’s still more room to tweak. But, I’ve got 15-20 new blog posts sitting in the wings from this, that go deeper into the hows and whys of each part of site performance. So be looking for those to start rolling out. And, I’ve got two more case studies ongoing right now. All of these sites are very different, as are the performance goals. So, be looking for those to roll out closer to spring. There’s definitely enough variety here that you’ll find at least one tip to actuate that may make all of the difference to your business this year. And I want to say a special thank you to all the folks who have been reaching out to me about Tips Tuesday. It really means a lot when you leave a comment on the blog or social media site where you saw the post. I hope you’ll consider saying hey and letting me know what you find most helpful this week. That really makes a difference in what I choose to share from over 100 blogs and folks I follow to keep us all up to date with industry changes and helpful tips. And an extra special thank you to all the folks who share these weekly roundups with your peeps. Thank you, thank you, thank you. If you use PayPal, you’ll want to know about something coming down the pike. They’re going to let you take payments from your site. It will be in a lightbox window, but folks never have to jump over to the PayPal site. Now, before you get too excited, know that they’re only rolling this out on a limited basis right now to select partners. I’ll keep my eyes peeled for more news on it. But if you hear anything, you’re welcome to drop me a note with a link to the news. If you use OptimizePress, you need to update it immediately. Sucuri had reported a vulnerability a few weeks ago, but it was only on a few sites. Now 2,000 sites have been affected and Google has blacklisted 1,500 of them. The update will fix the iframe issue where the malicious code is being injected. Remember last week in Tips Tuesday I told you that the WordPress developers were revamping TinyMCE and part of that might be adding playlists for audio and video files? Well, according to the latest post on the WP dev blog, looks like they are actively working on it. I am thrilled. And, looks like they are trying to make the player match the look of your theme by default, which is a way cool bonus. StudioPress has a new theme out called Parallax Pro and it has a neat effect. The background scrolls slower than the text over it. Well, at least it does on desktop. The effect seems to be completely lost on mobile, at least it was on my iPad. It has super nice typography choices. And the Author page and blog page layouts are different and cool too. So go check it out. For all those who use and develop on the Genesis framework, you’ll be tickled about this. +Brian Gardner just announced a new podcast is coming to the Genesis RoundTable. The last one was recorded last summer and was super. It highlighted all of the changes in the new Genesis 2.0 version. Can hardly wait to see what they’ll be discussing this time. And speaking of Genesis, +David Decker has outdone himself with another super plugin called Genesis Featured Page Extra. It has 21 options compared to the default 9 in the regular plugin. And the one that has me super excited is that you can input teaser content. That means you can use that for what shows on your home page widget. And then leave the first few lines of the actual page for SEO and viewers, and then use the WordPress SEO plugin by Yoast to optimize your meta description for SERPs. Win, win, win. Why does some web work cost more than others? There are a lot of elements that factor into it. And +Johnathan Perez https://plus.google.com/+JonathanPerezSureFire/posts does a good job of explaining it in this post. And you might want to bookmark his site because he promises two more posts on this topic soon. Every Guide I’ve read from Neil Patel has been absolutely stellar. And this latest one is no exception. It looks a lot like an infographic, but it has links to each chapter after the excerpt. So, be sure to click on them to get to the good stuff. I think what you get from this post by Neil Patel depends on what the focus of your outreach is. Since a recent video from Google’s Matt Cutts stating how they don’t index signals from Twitter and Facebook, this topic has been a hotbed of discussion. Neil’s post cites studies that beg to differ with Matt’s statements. Now, if your goal is to rank well in search, then you’re going to use social media to help you do that. And this post from Neil should encourage you to keep on keeping on. But, if your goal is to use social media for relationship marketing, you’ll see the stats in this post a little differently. Creating content and posts on social media that garners more engagement and shares is good for your business regardless of how it effects search rankings. And that’s going to lead directly to more sales. And those posts on social media don’t all have to lead back to your site. They can be social for social’s sake. One thing I do want to point out is at the end of Neil’s post where he says that if you don’t have time to be active on multiple social media platforms, be sure that you’re active on G+ if your goal is to impact search. And I would say, be active on G+ no matter what. Did you know that posts on G+ acquire both internal and external PageRank? Yep, you get brownie points with Google twice. 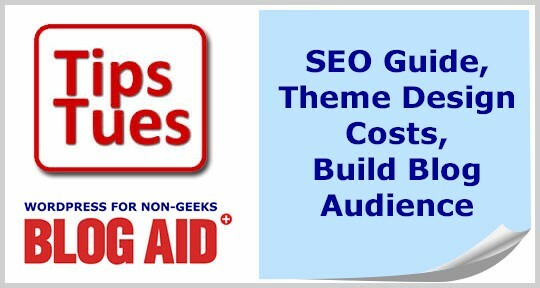 In this post from +Mark Traphagen. He gives you a clear picture, literally screenshots, of how it works. I will be reading this most excellent post from +Ana Hoffman for the entire month of February. It will take that long to read her material, and all of the top-notch links she references. And it will be worth every minute of my time. The old ways of doing SEO just won’t work anymore, folks. This post touches on everything you need to know going forward. You’ve got to go see this post. That’s a wrap for this week’s Tips Tuesday podcast. Please jump on over to iTunes and leave a review for me. I sincerely appreciate everyone has been doing that. And, feel free to leave a comment here on the blog or on G+. I love hearing from you. Be sure to visit BlogAid.net for more tips and resources and I’ll see you online.